Nowadays, Google is giving lots of updates like Google I/O, Google Lens and ARCore. Three months ago, Google had already announced one of the best upcoming technology ARCore System which is the best platform for building AR experiences. Basically AR stands for Augmented Reality (AR) experiences. But at that time, the working of AR was untold and on May 8, 2018 Google defines everything about ARCore. ARCore generally works in all the versions of IOS and Android and it will help to carried multiplayer. 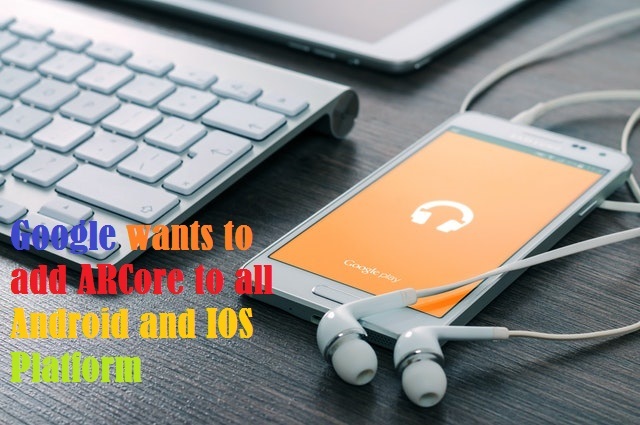 As we know that, there are tons of Apps available on Google Play Store but the worst things on all these Apps are its Multiplayer system but now Google wants to add ARCore system to all Android and IOS Phones. It will definitely reduce the disadvantages of Multiplayer system. AR means, “If you want to share anything with your friends then with the help of this AR, you will share anything not only one friends but group of friends. You can also play games with the multiple players and in the last versions of player, only two or three or four players played the game. But now with the help of AR, lots of friends will play the one game. The other features of AR is Vertical Plane Detection which means that you can place your own pictures on your wall. In this, you just have to point your phone to the wall and open the AR and after that, you have to add those image which you want to place on your wall. So as a result of this, AR will definitely help to you. The other best Technology of AR is Faster 3D Development. Various Java Developers are now building a best 3D platform for the Apps which will help you to remove complicated open GL and makes easy and working apps. Hence, In this Article, we discussed Google wants to add ARCore to all Android and IOS Platform and if you have any query about this, then put your question in comment section. I will reply your comment as soon as possible and thanks for reading this Article and also share this article with your friends and family. Must Follow us on your social networks. I love your site. We should definitely connect. I’m a school counselor and recently launched a site for parents to address pertinent teen topics. Like you, I struggle with the ultimate service I’d eventually offer on my site, but Ramsay’s idea is a great start. He’s absolutely right that people are looking for fresh content for their sites! Best of luck to you and I hope we can collaborate.